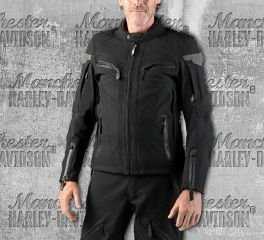 You've come to the right place for a men's FXRG® motorcycle riding jacket. Shop the collection of midweight and perforated leather jackets to keep you cool and protected on your rides. Take cover in the men's FXRGRain Jacket and thunderstorms have zero chance of shaming you to seek refuge at the next overpass. The breathable, waterproof construction withstands downpours and pelting rain. Added reflectivity helps riders be seen for confidence in sketchy road conditions. Easy to roll and stow (storage bag included), this men's rain jacket includes trusted, foul-weather elements like seam sealing, helmet-friendly hood, and neck cinch. Stay Dry: Waterproof, breathable Schoeller® construction ensures optimal body climate. Seam-sealed interior and double seam-sealed shoulders. Waterproof zippers and pockets. Hook-and-loop storm flap. Neck cinch to help block elements. Design Details: 3M™ Scotchlite™ Reflective Material stripes and graphics. Ride Enhancing Features: wo-way zipper front. Airprene collar and throat guard for comfort. Underarm zipper vents. Reinforced elbows and shoulders. Elastic and adjustable cuffs. Zip-off bungee cord and toggle helmet-friendly hood stows in collar. Other Features: Zipper hand-warmer pockets pass through to interior. One interior zipper pocket. Storage bag included. Silicone grip strip helps prevent keep jacket in place for greater coverage. Materials: Schoeller® shell is 79% nylon, 21% polyurethane. Schoeller® elbow and shoulder panels are 74% polyamid, 12% polyester, 10% polyurethane, 4% elastane. Stay Cool: Patented Triple Vent System for customized cooling with stay-open bungee tab for wider opening, less bulk, and increased airflow. Sleeve vents for added ventilation. Stay Warm: Compatible with FXRG® Thinsulate™ Mid-Layer (98263-19VM, sold separately) for customizable warmth. Stay Dry: Waterproof, breathable Schoeller® c_change construction ensures optimal body climate. Seam sealed. Waterproof zippers and pockets. Neck cinch to help block the elements. Interior storm flap. Stay Comfortable: Coolcore lining wicks moisture from the body and moves sweat through the Schoeller® c_change breathable membrane for year-round comfort through thermal regulation. Fit & Mobility: Pre-curved sleeves. Bungee cord and toggle hem. Jacket-to-pant back zipper attaches to FXRG® Waterproof Overpant (98321-19VM, sold separately) for full coverage. Pockets: Zipper hand-warmer and chest pockets. Interior Faraday pocket for increased information security. Additional interior pockets include one stash pocket, one zipper pocket with media port, and three credit card slots. Design Details: Contrasting vent linings. Printed graphics and custom FXRG® tape on lining. Embossed graphics. 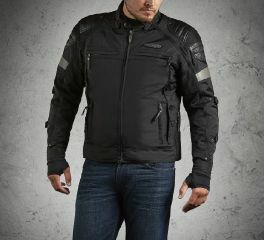 Designed to exacting standards to fit the men's FXRG® Triple Vent System Switchback Leather Jacket. This FXRG® Replacement Waterproof Liner helps offer protection against the wet stuff so you can keep logging miles. 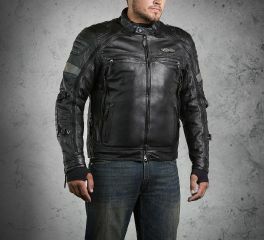 Designed to exacting standards to fit the men's FXRG® Triple Vent System Switchback Leather Jacket. This FXRG® Replacement Warmth Liner offers a lightweight layer of warmth using 3M™ Thinsulate™ Insulation and thermal reflective technology.